First Source of Tonawanda, N.Y., is recalling 9-oz. 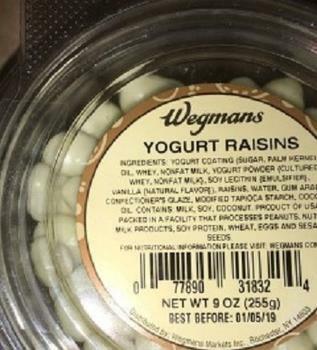 packages of Wegmans Yogurt Raisins. The recalled product was sold from January 16, 2018, to the present at Wegmans stores in Massachusetts, Maryland, New Jersey, New York, Pennsylvania and Virginia. Consumers with questions may contact Wegmans consumer affairs at 855-934-3663, Monday through Friday, from 8 a.m. – 5 p.m.